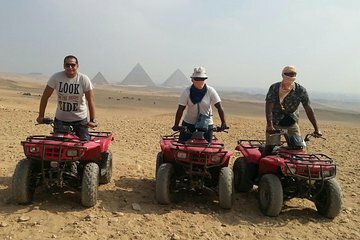 Monta en quad en el desierto alrededor de las Pirámides de Giza en esta inolvidable aventura privada del desierto desde El Cairo. Viaja con un guía privado a la meseta de Giza, obtén instrucciones para conducir tu robusto vehículo de 4 ruedas, abre el acelerador y ruge sobre la arena. Corre a través de la llanura de Giza, vuela arriba y abajo por las dunas bajas y siente la corriente del cálido aire del desierto. En el camino, deténgase para admirar los impresionantes panoramas de El Cairo y las tres pirámides, Cheops, Chephren y Mykerinus, construidas como tumbas para los faraones del antiguo Egipto. Incluye recogida en el hotel y traslado en minivan con aire acondicionado. This was so fun!! They start of at their bike shop in the town right by the pyramids and we drove our ATVs through the city which was actually cool to people watch and wind through the streets. Our guide who was this sweet young boy, maybe 14 years old was really great too. He took us to the perfect spots to take pictures. This was a very cool way to view the pyramids! My friends and I preferred this to the sterotypical camel rides. Mady was able to show us around and give us all the information we needed for our first day in the country. He was very funny and made the experience very enjoyable. If you ever are lucky enough to get him as your tour guide you will be treated with a very thoughtful and genuine person! He is very open to answering any questions you have about anything related to Egypt. If he doesn't know off the top of his head, he will find out for you. The Ride was not 90min, approx 50 Minutes Only... We booked with the German Guide Option, but without any Information it was not a German speaking Guide. The Guide was very friendly, but that was on of the small good Things of this Tour.